Roulette is one of the most interesting and exciting games to play. 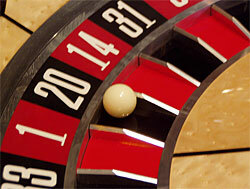 During the course of roulette history many changes and improvements were added to make the game even more attractive. Playing roulette is an interesting journey with lots of gripping stories of how people managed to win big in such a tricky game of chance. People who beat roulette were either extremely luck y or very skillful cheaters who have found casino weak points or made used of roulette betting systems. Let's have a look at the most famous bets made by ordinary people in roulette history. 1873 - Joseph Jaggers is famous not only for winning big in roulette but also for exploiting the roulette biased wheel. He and 6 his partners carefully observed all roulette wheels in Monte Carlo casino and eventually found the one with great bias. They were smart and skilled enough to take advantage of it and won $325,000! That sum was incredibly high at that time! 1891 - Charles Wells, the British swindler, managed to beat roulette in Monte Carlo. He broke the bank at the roulette table he played and won incredible sums! He is known worldwide from the song "The Man That Broke the Bank at Monte Carlo." 2004 - Ashley Revell from London became famous for selling all his possessions and even clothes to get $135,300. He made this crazy step to place this big sum of money on red in Plaza Hotel in Las Vegas. The bet was placed and he actually won! The payout of the even-money bet is 2 to 1 so he brought $270,600 home. 2009 - Derren Brown is famous for betting Â£5000 on single money bet in casino in Europe. That is not strange for players to place single bets but Derren Brown was using the laws of physics in order to predict the winning number. The speed of the wheel and the ball should have helped him. Derren waited around 3 seconds after the wheel started spinning and placed Â£5000 on number 8. It was sorry to see that the ball landed on the number 30, which is right next to 8.